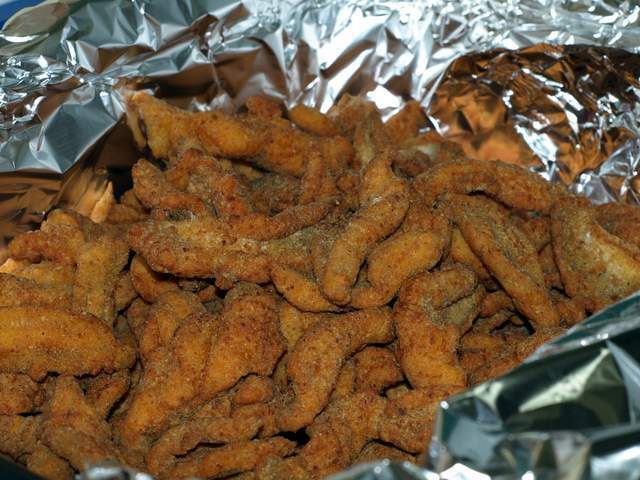 Chances are, if you live in southern Louisiana, you aren’t very far from a Lenten fish fry today. Many Catholic churches or Knights of Columbus groups sponsor fundraising fish fries, honoring the religious and cultural tradition of meatless Friday meals. Catfish predominates, though some parishes use donated, locally caught fish like speckled trout, redfish, and drum. At these fish fries, a light breading (part flour and part cornmeal) seems to predominate, seasoned with a healthy dose of black and red pepper. More than a few groups dip the fillets in mustard before a quick roll in the coating meal. I haven’t run across any wet-battered fish, though. The K of C in my local Catholic parish, St. Anthony of Padua in Luling, puts on a mighty fine spread, selling more than a hundred takeout dinners each week. 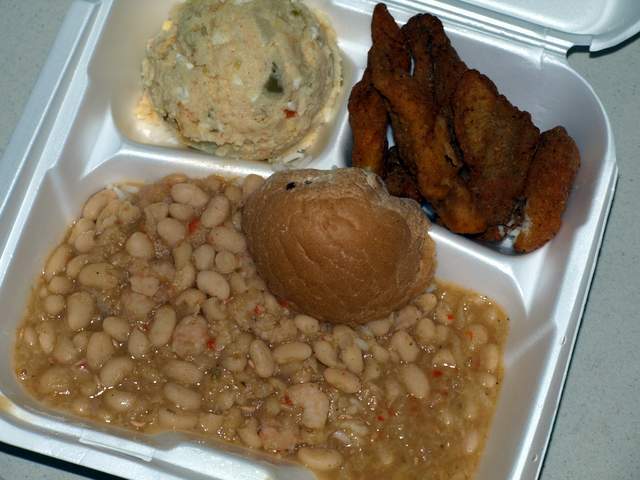 For the modest sum of $8 a plate, each diner receives fried wild-caught Des Allemands catfish, spicy white beans cooked with shrimp, potato salad, bread, and dessert (brownies, bundt cake, or other homemade goodies)*. Generous bowls of seafood gumbo are also available. Indeed, the gumbo is so popular, on my last visit to the KC’s temporary cafe, I encountered many folks toting in blue-flowered Corning Ware dishes, intending to carry out enough gumbo to feed whole families. Churches all over the Archdioceses of New Orleans, Houma-Thibodaux, and Lafayette participate in the fish fry tradition. Look up your local Catholic church and see what specialties are on display in addition to the fried fish. *Count the starches: flour on the fish, rice under the beans, potato salad, bread, and a flour-based dessert: five! You know it’s a real Cajun dinner when every single item involves a starch! KC’s by my house make some smack ya mama good fish every Friday in Lent too. Mustard on the fish before breading? Is that regular yellow French’s mustard? Also, how come the potato salad is brown? Thanks for this great write up… makes me hungry for some churck food! Yes, regular yellow mustard (or whole grain “creole” mustard if you like), spiked with a couple jolts of hot sauce. It’s a pretty aggressive flavor, so it’s nice to jazz up a mild fish like catfish. Now, that potato salad is full of mustard as well, plus chopped, pimento stuffed green olives, paprika, hard boiled eggs, dill pickle relish, chopped celery, and mayo. Very typical of potato salad in my area….